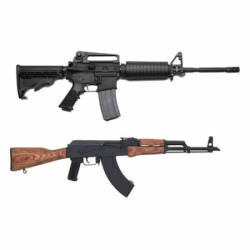 I have considered this for a few years , what would be the best combination of caliber’s for a basic self defence/survival For minimum money and maximum bang. For the uninitiated or new shooter I would suggest 22lr, 38/357 , 12 gauge, and 7.62×39 , and the following matching firearms Ruger 22 pistol, and a bolt action 22 lr rifle , a 38/357 Taurus tracker and 38/357 lever action rifle , a 12 gauge remington 870 pump with an 18 or 20 bbl and finally an AK several very reliable manufacturers of the auto loader available. Unfortunately I have more than 4 caliber’s in my collection and I will add more sophisticated options later. If I had to drop 1, I’m not sure what it would be. Probably the 308, since most things can still be hunted with the 12 gauge; you just need to get closer. This is really just my personal preference. Everyone has their own preferences, and these would be the most functional for me and my family. Which 7.62 the 7.62×51 ?? Damn…I have to choose? I didn’t think about that. I would probably choose 7.62×39, though I love M240’s. From a theoretical point of view, I don’t see anything wrong with any of the lists posted here so far. As a practical mater I’ll just point out that about half the firearms I own came to me without my really looking for them. 22lr is essential, but problems getting ammo the last few years make it far less useful than it otherwise would be. I have a Ruger Mark II, a Ruger 10/22, and a Heritage single action revolver (basically a single 6 clone). The last I bought at a gun show on impulse. Just for fun I have a 38 special S&W snubby, a 38/357 model 66 revolver, and a Winchester model 94 trapper in 38/357. I don’t know how piratical this is but but they say the old cowboys liked a long gun and a pistol that take the same ammo. I think it’s fun. I carry the j-frame almost all the time just because. A friend at the range had a 30 06 Remington 742 (woodsman) for sale one day. I wasn’t in the market but I liked it and I bought it. It’s been my favorite white tail gun for years now. It just has good ju-ju, if that makes any sense. I bought the over under 12 gauge at Walmart of all places when I took an interest in trap shooting a few years ago. The 410 was another gun show impulse buy. It is handy around the farm for assassinating varmints and superfluous roosters. The 223 is a Kimber single shot bolt action rifle that was a gift. It has a scope suitable for astronomy. It is a very good long range varmint gun, and deserves more of my attention than I have so far given it. I inherited a 45 acp and the 243 from my late brother. The 45 is a good trunk gun. The 243 is still unemployed except as a keepsake. The golden rule of firearms, always buy, never sell. Sooner than you think you end up with a nice collection. You and me both brother I have more that practical for survival/SHTF so I have a few cartridges I beefed up just happened to pick 308 , 22lr , 12 gauge, 357/38 , 45-70 , 44mag and keep the rest because of sentimental or collectable value. So, we have a couple of guns that use .22lr. But does anybody know where to GET some?? It’s absurd. We initially got the weapons because the ammo was cheap and readily available. But I haven’t found any anywhere in the last 6 months! Suggestions would be appreciated. Other than that, the 12 gauge is awesome, though for myself I prefer to shoot a 20 gauge. Easier. And 9mm. So versatile. Looking forward to eventually getting a S&W 929, when I can afford it. Since gunbot.net was started, I have never had a problem buying .22LR. Is it pricier than it used to be? Yes. Is it available if you are willing to pay the prevailing market price? Yes. #1 is really cheating, but only in the way that the OP cheated. 🙂 My Ruger Single Six can shoot .22 WMR and .22 LR, though shooting .22 LR from the magnum cylinder will result in more fouling and suboptimal performance. But the .22 WMR can serve adequately as a self-defense round (~50% hotter than the .380 ACP), making that pistol a reasonable last-resort defensive firearm. Loaded with .22 LR, it becomes a decent grocery-getter suited for taking rabbits and other small game. And of course, .22 LR rifles are ubiquitous and make great, low-cost training tools. #2 isn’t really anything special in terms of ballistics, but I have been shooting .308 a long time, I reload it, and I hunt deer with it. The round is reasonably stable and retains adequate energy at medium-to-long ranges to make it useful for longer shots on larger quarry. Ammo is relatively plentiful, and reloading components for .308 are everywhere (think of all the cartridges that use thirty caliber bullets that could be seated in a .308 case). #3 gets a bad rap as underpowered, but I think it is a great defensive round for someone who needs to be able to move easily but still have the capacity to put out a good volume of rifle fire. With careful shot placement, it is also adequate for game as large as deer, and it is more than adequate for any number of smaller game animals. Because it generates only modest recoil, this round is a good option for smaller shooters, including children and petite women. E.g., my wife would be very intimidated by my .308 Win bolt gun’s recoil impulse, but she could shoot my AR all day long without flinching. #4 is the obvious choice for an all-around cartridge. With an ammo menu that ranges from slugs to buckshot to turkey loads to dove loads, a 12 gauge shotgun will let you bring down just about any game animal this side of a rhinoceros. It will do pretty well on bad guys too, though each cartridge costs you a lot in terms of weight added to your pack. The weight per round and limited range rule this out for me as a mobile defensive option, but I think it is a great all around choice for sporting and home defense applications. And FWIW, I currently own firearms chambered for the following cartridge types: .22 LR, .22 WMR, .380 ACP, .38 Special, 9mm, .40 S&W, .45 ACP, .223 Rem/5.56mm NATO, .300 BLK, .308 Win, 20 gauge, and 12 gauge. I am pretty ecumenical when it comes to ammo types. I also have a fondness for the .308, I really like its flexibility ( it used to be cheap) and general economy , If pressed I would recommend to folks that a 7.62×39 might be a better choice because of cost ammo and availability of inexpensive firearms , and its bang for the buck seems to put it a better light than the 308. That being said I don’t own any 7.72 x39 , but have lots of 7.62×51. From a reloading standpoint, 12 ga and .308 are the most versatile, the first having readily available primers, the ability to use any kind of powder (with caution), and the flexibility in projectiles, the second being the caliber used in 30-30, .308, 30-06, and all military 7.62 applications, among numerous others. In pistols, the 9mm, .380. ,38, and .357 will all take a .355 bullet, though with varying degrees of accuracy, but having four bullet sizes between .355 and .357 would handily cover all applications. The .22 is a given, but I may be tempted to replace it with a .45 or .50 muzzleloader, which can be nearly as versatile as a shotgun, and suitable for any hunting. Mike, these are great points from a reloading perspective, and those cartridges are certainly versatile. A high velocity airgun in .22 or .25 could replace some functions of a .22, and it is much easier to come up with ammo. Good point on the air, Nate. I have ,177’s now, but a .22 air rifle would certainly be more effective. Hmm, well since my country has been disarmed I’ll have to improvise. I would echo almost everything posted here already. Just wanted to add my affection for the good ole 12 gauge shotgun. I have three and love them all. My Dad’s (passed away 10 years ago) old Remington 870 Pump, my go to Benelli Super Black Eagle I (bought for $500 from a guy who dragged it through most of the swamps of the Southeastern US, still cycles like a champ) and a recently purchased (at a gun show from a pawn shop owner who got it for a song in a bulk estate buy of premium shotguns) Beretta Silver Pigeon Over Under. The last one is a beautiful gun, really an heirloom. It is not a gun I would suggest to a newbie and it is certainly not a practical SHTF firearm. That said, owning such a beautiful, perfectly designed thing makes you want to be worthy of it. I am going to become a clay pigeon killing machine. And if worse days really are ahead, clay pigeons can become real flying meals and that will be a good thing.